THE OVERVIEW: "It’s a piece of news Daphne never expected to hear: Her globe-trotting friend Skylar, who vowed never to get married, is engaged! Time to celebrate in Manhattan—Skylar’s treat, of course. After years scaling the corporate ladder, she can more than afford it. The fun-loving trio readers fell for in Wait for the Rain is together once more. Here's to the power of friendship!" THE REVIEW: This is the second book in the Daphne White series. I reviewed the first book, Wait for the Rain in 2015 (you can refresh with the review here). I was incredibly excited to read this book. Unlike movies, subsequent novels in a series are just as good as the first. I was looking forward to the adventure that this story will bring-- not only for Daphne, but for myself as I live vicariously through her experience. This story begins with Skylar contacting the other members of their in-circle group, the Three Musketeers via video chat. She informs Daphne and KC that she is getting married to a guy that neither of them met, and she wants to fly both of them to NYC for a "non-bachelorette" weekend. As the story goes on, the readers become enveloped in each of the character's problems-- Skylar is afraid of becoming rejected by her true love, KC is a step-grandmother and soon-to-be mother, and Daphne authors her first book in years and gets rejected by the majority of the publishing agencies that she contacted. At first the women are shy to their issues and do not bring them out into the open. As the story processes, this changes. 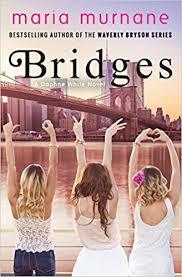 A common element that I found between both books was the link between Daphne's feelings of loneliness in Wait for the Rain and her feelings of inadequacy in Bridges. I think Daphne's feelings are extremely relatable, and I just wanted to reach out and give her a hug. Daphne's growth as the novel advanced is notable, and it was intriguing as to how she let stressors in her life affect her behavior throughout the course of the story. This time, we are already familiar with some of the characters so the story took off pretty quickly. Through the story, we are also introduced to many new characters-- James (Skylar's fiance), Sloane (James' daughter), Krissa (Skylar's best NYC lawyer friend), Derek (Daphne's sort-of boyfriend), and a re-made version of Clay Handsome (yes, he's back!). So, how does the book end? You are just going to have to read it to find out. You will not be disappointed! + Keeps interest with consistent dialogue between friends. + I felt a personal touch from the author, especially during Daphne's struggle with her newly written book. + Very relatable issues in the story-- we can all feel inadequate, jealous, stressed, depressed, and lonely at times. - I was pretty upset when Derek answered the phone... and he was with another woman. Yes, Daphne wanted to break it off, but he didn't know that at the time. At least she had the decency to call him. I'm glad she didn't continue on with Derek the Toad. - There was a lot of 'outings' between the friends, but instead of going to a restaurant one night, what could've happened if they went to Hunk-O-Mania, the all-male dance extravaganza? I would have loved to read about another crazy night between these girls! • YES, Daphne spends time in NYC with her best friends for an event-filled weekend. • YES, Daphne struggles with the advancement of her new novel. • YES, the women learn a lot about the issues and secrets surrounding each of their lives. This book (paperback, because I'm partial to them!) costs $10.03 on Amazon. You could also read it for $1.99 on your Kindle, and it's available on the Kindle Unlimited Plan, if you have that. You can also read the first chapter for free on Maria Murnane's website. RECOMMENDATION: YES, I definitely recommend this! Please refer to the pictures/review to see why.